The Ameise® hydraulic stacker truck with two-stage telescopic mast is characterised by its robust construction and durable quality. It is ideal for occasional use as a lifting or transport device. Thanks to the telescopic mast, the truck can be used for stacking at heights of up to 3000 mm. The Ameise® hydraulic stacker truck with single mast is a versatile aid that is ideal for transport tasks and occasional stacking of palletised loads. Available in a range of capacities and lift heights, the Ameise® hydraulic stacker truck covers a wide range of applications. The Ameise® electric stacker truck is the cost-effective entry model in the electric stacker truck segment. It is designed for the lightweight internal transfer of goods. The truck with the two-stage telescopic mast is ideally suited for the occasional stacking and retrieval of pallets up to a height of 3,300 mm and convinces with proven and reliable Ameise® quality. The Ameise® Quick Lift hydraulic stacker truck offers proven Ameise® quality for rapid pick-up and transport of all loads. The quick lift function allows you to achieve greater throughput with reduced effort. The Ameise® electric stacker truck with mono mast represents a cost-effective entry-level model in the electric stacker segment. 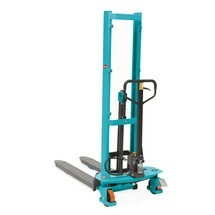 This truck is ideal for the easy lifting of goods to an ergonomic working height and the occasional stacking of pallets at heights of up to 1,950 mm. The electric stacker truck is designed specifically for light-duty use in small and medium-sized operations and convinces with its proven and reliable Ameise® quality. The Ameise® wide-tread hydraulic stacker truck is characterised by its robust construction and durable quality. It is ideally suited to the provisioning of goods, removal of individual products from a pallet as well as the ability to lift UK pallets and the longitudinal and transverse lifting of Euro pallets. Loads weighing up to 1000 kg can be raised and stored at heights of up to 1600 mm. The electric hand stacker provides you with a cost-effective aid for performing occasional stacking operations (1600 to 3000 mm lift height) as well as loading and unloading commercial vehicles. With a capacity of 1000 kg, the HC 110 also serves as a useful work table, for example, for keeping goods or individual parts to hand at an ergonomic height. The BASIC hydraulic stacker truck with single mast is an ideal solution for the manual transport of pallets or piece goods. These trucks can also be used for occasional stacking and retrieving of pallets or for loading and unloading HGVs without the aid of a ramp. This load hook represents a functional and secure solution for raising crane-liftable goods with a forklift truck. Our range includes versions with a maximum capacity of 1000 and 2500 kg. The Jungheinrich EJC M10b E wide-track electric stacker truck was developed specifically for occasional use as part of your in-house goods transport. 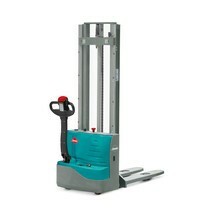 The electric stacker truck is suitable for handling loads weighing up to 1000 kg and stacking pallets up to heights of 1900 mm. The mono mast also makes it an ideal tool for order picking. In its standard configuration, the wide-track version can accommodate pallets up to 882 mm in width. The distance between the support arms can be further increased up to 1252 mm using optional adapters, which are available separately. The BASIC hydraulic stacker truck with telescopic mast assists with your pallet transport tasks and occasional stacking and retrieving of palletised goods. These trucks are also ideal for loading and unloading transport vehicles without the aid of a ramp. Are you looking for a reliable, cost-effective forklift truck suitable in a variety of different applications? Then the Ameise® diesel forklift is the perfect truck for you. Proven Kubota engines reliably deliver enough energy for universal transport and stacking tasks. 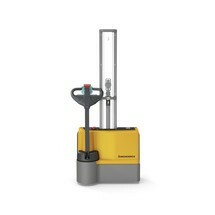 It’s simple to use too, the intuitive and direct handling allows operators straight-forward and easy operation. This robust and durable forklift truck is the ideal solution for outdoor use. 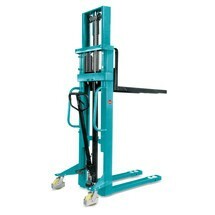 A Pallet Lifter can also be known as a Pallet Stacker, High Lift Pallet Truck, Stacker Truck or Support Arm Stacker. 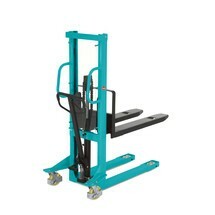 Pallet Lifters move and lift pallets to allow storage in racking or loading and unloading of vehicles. 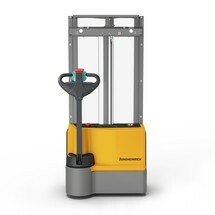 With Hydraulic and Electric Pallet Lifters in various lift heights available to buy online (with free delivery to mainland England, Scotland and Wales) - Jungheinrich UK PROFISHOP has the right solution for you. 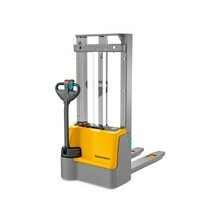 A Hydraulic Pallet Lifter is the entry level option to enable the occasional lifting and stacking of pallets. The forks on a Hydraulic Pallet Lifter are raised usually by manually pumping the tiller arm or by a hydraulic foot pump. If you are lifting pallets with closed boards around the bottom edge on all sides of the pallet you will need a Stacker Truck with support arms that surround the pallet to avoid trapping the forks and arms between the lower and upper boards. An Electric Pallet Lifter or Electric Pallet Stacker Truck allows you to move, lift and store pallets either in racking or to use loading or unloading vehicles. 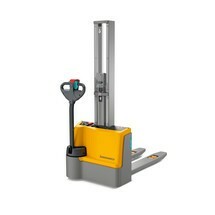 Electric Pallet Lifters have full electric lift and drive to enable effortless pallet transportation and lifting. Various lift heights and lift capacities are available depending on your needs. 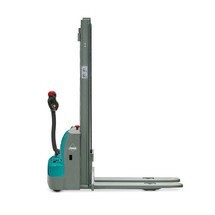 When selecting an Electric Pallet Lifter check that it is suitable for the pallets you will be lifting. If the pallets you are lifting have closed boards around the bottom edge on all sides, you will need an Electric Stacker Truck with support arms that surround the pallet. If you are lifting pallets that are open on one side (for example 1200 x 800mm Euro Pallets that have no bottom boards on the 800mm face) then a standard Electric Stacker Truck with forks that wrap-over the support arms will be suitable.